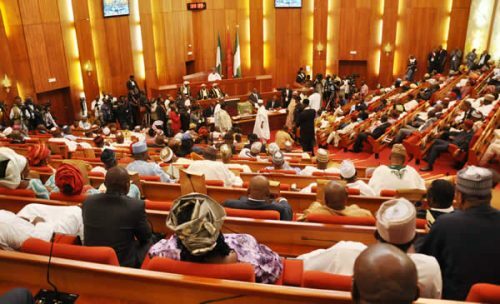 There was crisis in the Senate on Wednesday as members of the Peoples Democratic Party caucus stormed out of the chamber during the plenary after a Senator representing Ondo South, Sentor Yele Omogunwa, defected to the All Progressives Congress. The PDP Senators stormed out of plenary shortly after the Senate President, Dr. Bukola Saraki, read the letter written by the lawmaker to formally declaring his defection to the APC. The Minority Leader of the Senate, Sen. Godswill Akpabio, who is the leader of the PDP caucus, had urged Saraki to declare Ondo South’s seat vacant, since there was no division in the PDP to justify the defection. Saraki however ruled Akpabio out of order, a development that threw the plenary into rowdiness. The Minority Leader thereafter led other members of the PDP caucus put of the chamber in protest.